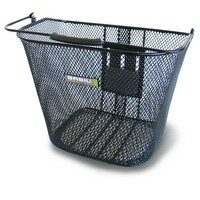 The Basil Boston XL is a large bicycle basket with a distinctly contemporary design. 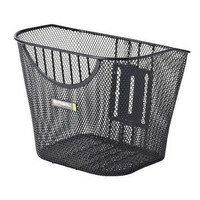 This basket is generously proportioned, providing you with plenty of storage space for all of your essentials. Designed to be mounted at the front of your bike, the Basil Boston XL is an oval-shaped basket that doesn’t skimp on storage. Practical and stylish, this basket is fitted with an adjustable bracket, meaning you can adjust it to a perfect height for you. The ideal companion for trips to the store for weekly shops, you can also use this basket to store larger items like briefcases and handbags. Furthermore, this basket can be used to store gym bags and kit when you’re running late for your workout, saving you the hassle of having to wear a backpack when cycling. 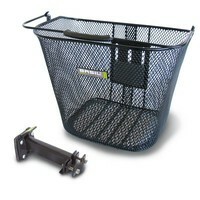 Made from a fine steel mesh, this basket is built to last, maintaining its shape after many a ride. 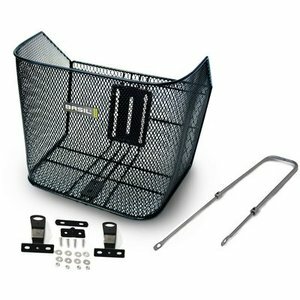 Mounting materials are included with this basket, allowing to arrange a perfect installation straight out of the box. 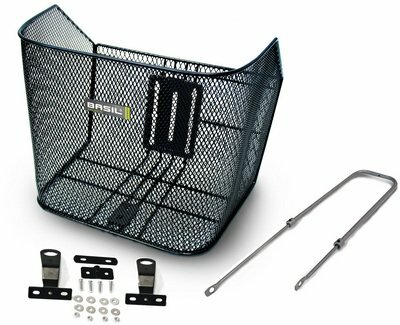 This basket is designed to be installed against the steering axis and front fork, with a bracket that’s adjustable (330-530mm). If you’re looking for something more unique with high-quality components and all the extras included, the Basil Boston XL is the right choice for you. Browse our complete range of baskets, bags and other cycling accessories online at Basil today. The Basil Boston XL is supplied with all the essential attachments and fixing materials. Extra large to house all of life’s essentials. An adjustable bracket allows for bespoke installation. Hello, would you please send me the manual to put the Boston XL on my bike.